Image caption The horse was described as "severely emaciated"
A dead horse has been found "callously" dumped by a roadside in East Yorkshire, the RSPCA has said. The charity said the young piebald mare had been found tied to a fence on Between Rivers Lane, near Snaith, on Saturday. 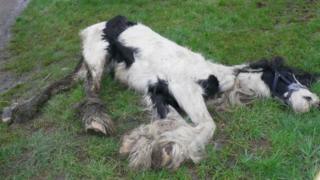 The RSPCA said the horse was likely to have been severely neglected while alive as she was extremely thin. An investigation by the organisation is under way to try and find who abandoned the animal. Insp Claire Mitchell, from the RSPCA, said it was a very "upsetting case". "It is horrifying that she has just been dumped like rubbish. It is so incredibly callous. She was so emaciated you could see every bone in her body. "It is awful to even think of the amount of suffering she must've gone through in her short life. It is utterly heartbreaking."